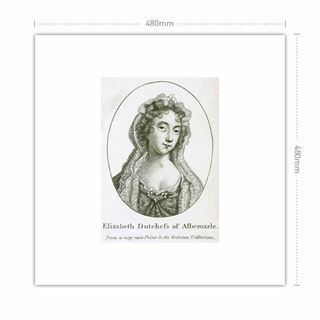 Elizabeth Monck, Duchess of Albermarle (and later Elizabeth Montagu, Duchess of Montagu), was born Lady Elizabeth Cavendish, the eldest daughter of Henry Cavendish, 2nd Duke of Newcastle and his wife Frances Pierrepont, daughter of William Pierrepontand. 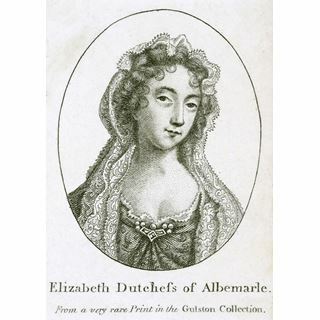 She was known for most of her life as the Mad Duchess of Albemarle. 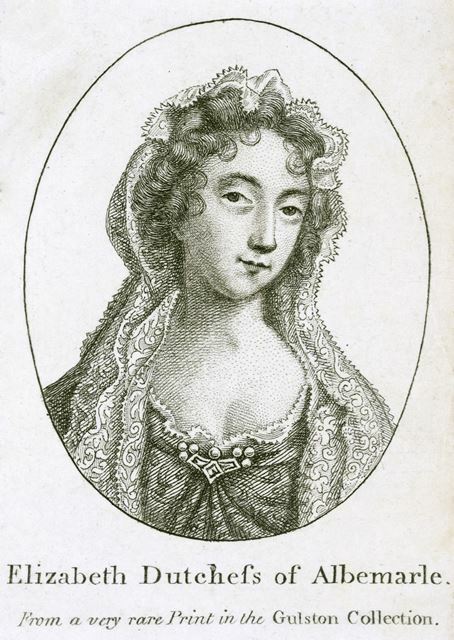 She married Christopher Monck (later the Duke of Albemarle) at Whitehall, London in 1669 and moved to Jamaica when Monck was appointed Governor of there in in 1687. 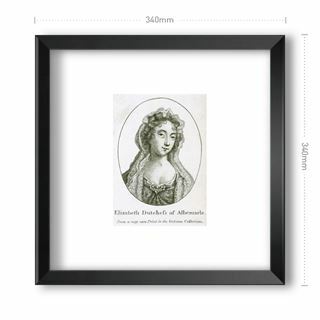 Monck amassed a small fortune, which Elizabeth acquired and brought with her back to England in 1688 when her husband died. From this time, Elizabeth had declared that she would only marry into royalty and was convinced that the Kangxi Emperor of Qing Dynasty China wished to marry her; suitably dressed as the Emperor of China, her sister-in-law Elizabeth's stepfather, the 1st Duke of Montagu asked for her hand in marriage and they were wed on 8 September 1692 in Newcastle House, London. 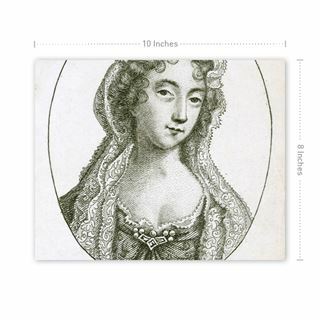 Elizabeth died in 1734 and was buried in Westminster Abbey. This image is one of a collection by the famous local antiquarian, Thomas Bateman, of Middleton by Youlgreave. (1821-1861). Bateman organized his collection by inserting them into a 4 volume copy of Lysons Magna Britannia, Derbyshire, creating a fascinating and unique illustrated record of the county. The purchase of the collection for Derbyshire Libraries was made possible by the generous bequest of Miss Frances Webb of Whaley Bridge, well known local historian, who died in December 2006.